There’s a saying that the only two things that will survive a nuclear strike are cockroaches and Boss pedals. And all joking aside, there is some truth to that. 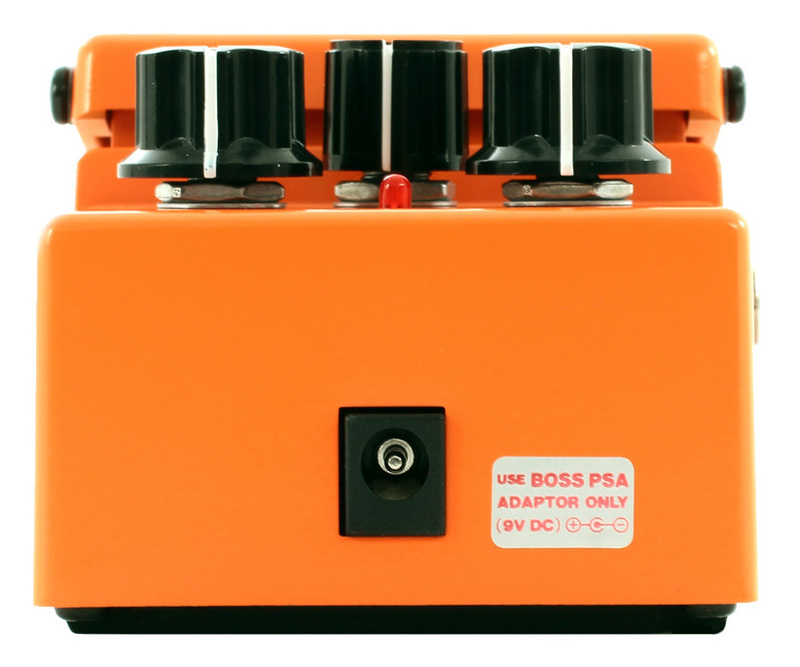 The design of the Boss compact pedal has proven itself to be extremely rugged and durable, no doubt at least in part due to the decisions made right from the beginning to minimize the direct contact between the circuit board and the outside world. The footswitch is connected with wires, rather than being soldered straight to the board. The same for the jacks and pots, which are also secured to the box. This means that outside forces – a singer stepping on the plug going into the pedal, or a lead-footed guitar player stomping on the pedal – will not reach the main circuit board. The most vulnerable point is the adapter jack – especially the type that sits on the circuit board, poking out through a square cutout in the box, since that is the only point of contact between the board and the outside world. But other than that, as long as the box itself isn’t crushed, the pedal will usually survive whatever is thrown at it (or it’s being thrown at). The designers of the compact series really got it right, all the way back in 1978. And ever since, even though their design is relatively costly to make (it requires a fair bit of hand-soldering, after all) Boss has been deliberately slow to change and have kept several models in production – some virtually unchanged – for decades. For instance, the SD-1 hasn’t changed materially since it was introduced in 1981. 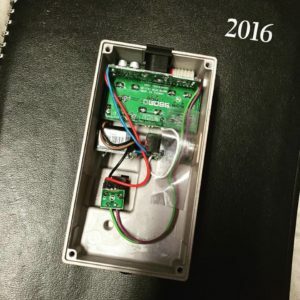 Of course, when designing new pedals, they’ve taken advantage of whatever technical advancements available at the time – not least SMT (surface-mount technology) components, which allow them to cram much more into the same space. But for the most part, they’ve tended to leave the earlier designs alone, except for when components becoming unavailable forced a redesign (see the DD-3 page for an in-depth on one pedal that has had several such changes). But all things must pass, as they say. This year, two of Boss’ existing pedal designs got a complete make-over, seemingly to make them cheaper to produce (partly by reducing the amount of hand-soldering). The DS-1 first appeared in 1978, underwent a small change quite early on (that momentary status LED was not a good idea 🙂 ), and then stayed largely the same until 1994. At that time, the DS-1(A) was born, sporting a different op-amp chip which forced a sligthtly redesigned circuit. The adapter jack was moved to the circuit board (easily identifiable by the jack poking out through a cutout, as the pic shows). The adapter jack circuit was also changed to PSA (regulated 9vDC) specs (detailed in the ACA/PSA article). From there on, the DS-1 only underwent tiny changes – both in 2000 and 2006 the op-amp chip was changed – but the circuit stayed the same. Until now, that is. 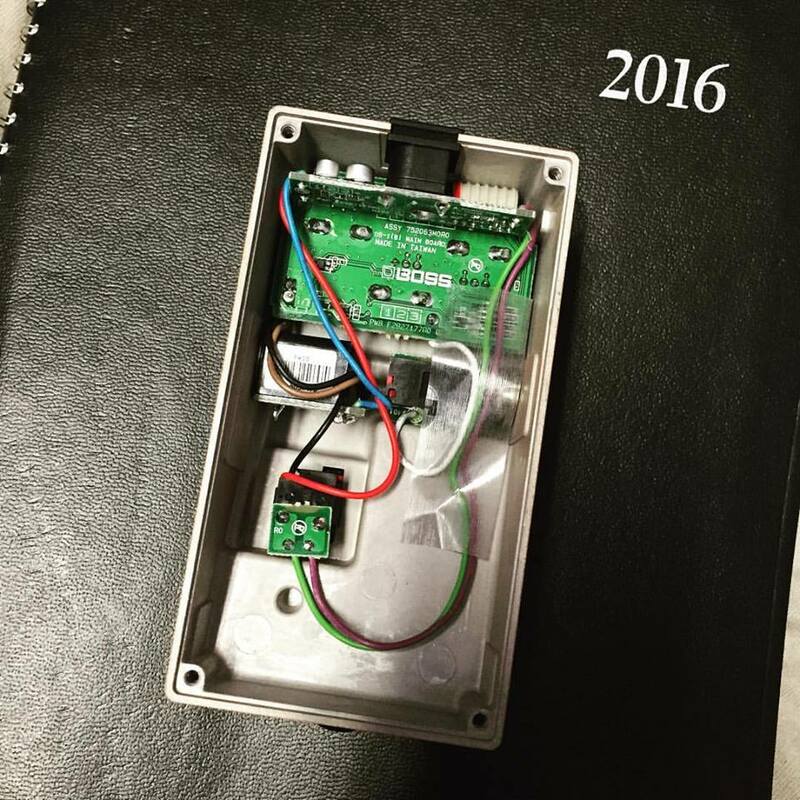 Sometime in the later half of 2016, DS-1’s started turning up with a completely different circuit board, named DS-1(B). The pic to the right is nabbed from Analog Man Mike Piera’s Instagram, and shows the new design. What used to be a circuit board covering the entire opening, full of through-hole components, have now been shrunk down to just fill the top part of the pedal. And I don’t even think the circuit design is very crowded – with the tiny SMT components, there’s plenty of room to spare. The black 40th Anniversary DS-1 still uses the old style circuit board (and yet another op-amp chip, by the way). If you can find one of those, you will have yourself a great DS-1 that is mod-able as well! This one caught me a bit by surprise – for some reason, I thought this pedal was new enough to not warrant a redesign. But as the picture (another Instagram pic I nabbed off what I believe is a Japanese user – if it’s yours and you want it taken down or be credited, let me know) shows, they did. 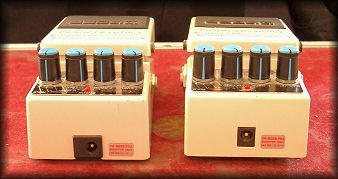 The original version to the right, with the new BD-2(B) to the left. The new design seems to have appeared mid 2017, and uses the same basic layout as the DS-1. It has a vertical power board that houses the adapter jack, and a horizontal board for the pots and main circuit. This leaves lots of space in the box, which Boss no doubt utilized in their Blues Driver/JHS Angry Charlie combo pedal, but there are of course downsides to this, as well as benefits. Well, the cheaper construction methods might point towards Boss trying to be slightly more competitive price-wise. But at the same time, they have kept the overall design brief with wire connections for the switch and jacks. So they haven’t gone all the way over to cost savings mode, which is good. They’ve worked hard to earn their bullet-proof reputation, and I’m glad they seem intent on keeping that intact. 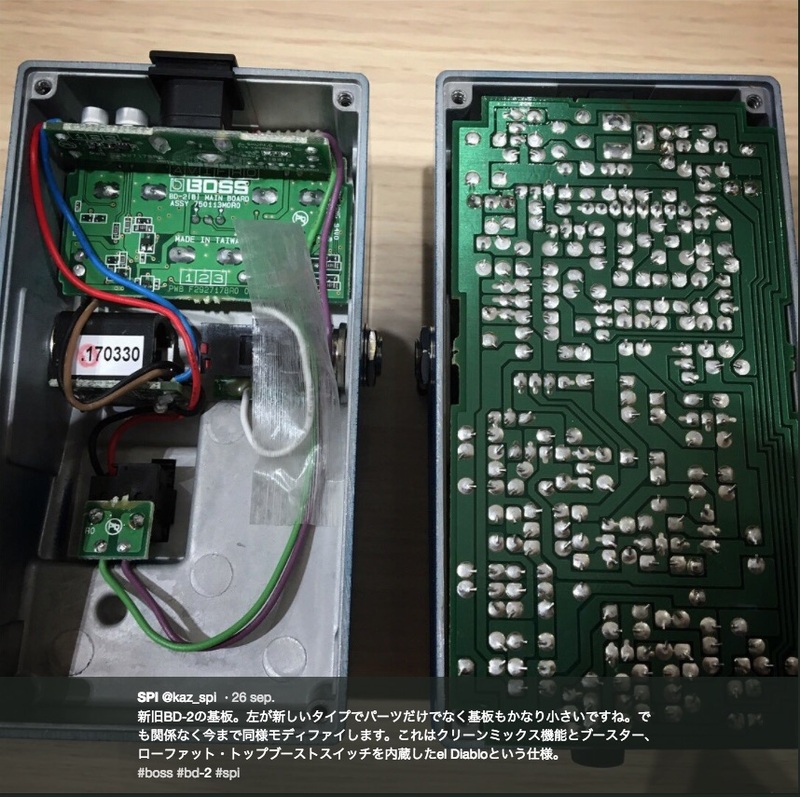 What remains to be seen is if this is the new design brief for Boss pedals – previously, they all had the same basic design, using a circuit board that covered the entire footprint of the pedal, with wires to/from the pots. These have a vertical power board carrying the adapter jack and power components, with the main board (carrying both the main circuit and the pots) underneath. It will work fine for the simpler circuits – those that can fit in the upper compartment – but when there’s more stuff to fit (such as in the digital delay pedals), they may have to keep the older design brief. Either that, or they’ll need a second board which is raised up to clear the jacks as it reaches down into the lower section of the box. In any case, for those of us who want to mod pedals – or have them modded for us – this change is not so good. Yes, it can still be done. The circuit is still there, and can be changed the same way as before. But you will need a really big magnifying glass and an extremely stable hand, to replace these tiny components. They are so small, that even seeing the numbers (to determine what kind of component it is, and its value) is nigh on impossible. So I suspect most modders will take a pass on these. And the same goes for repairs, sadly. While Boss compacts have a reputation for being sensationally sturdy, even they will sometimes fail – usually by the hands of owners who accidentally use the wrong power adapter 🙂 And while fixing pedals damaged that way used to be quite simple, it will be much harder with these new designs. Both the new DS-1 and the new BD-2 can be easily identified from the outside, since the adapter jack is the old style – the type that sits on the outside, rather than poke through a cutout in the box. The pic to the right is lifted from the DD-3 page, but shows what to look for. The old style (”external”) jack is on the left, and the ”internal” type is to the right. So both the BD-2(B) and DS-1(B) will have the ”external” type jack with PSA stickers. These can not be modified/repaired (at least not easily). Conversely, to identify the ones that can be modified/repaired, look for the ”internal” (right) type jack. With the DS-1, older versions with the ”external” jack will also work, if it has the ACA sticker (identifying it as a pre 1994 model). Also, the black 40th Anniversary DS-1 model has the older circuit, and can be modified/repaired as before. Update March 2019: Alchemy Audio recently spotted an SD-1 Super Overdrive with the new circuit board layout and design, similar to the redesigned DS-1 and BD-2. So it seems Boss is intent on converting more existing products to the new design. The new SD-1 will be much harder to spot from the outside than the other two, since it always has used the larger ”external” type adapter jack. Time will tell if the bottom plate decal is different enough to serve as an indicator. And another thing that also needs to be explored is if the new design has cured the age old bypass bleed issue (which was caused by a circuit board layout problem in the original version – an article about that is in the works).